Indian para-swimmer Sharath M Gayakwad on the lack of awareness about para-sports in India, winning a medal at the Paralympics, and knowing when to quit. When I turned nine, my school made it mandatory for us to learn swimming. My parents were apprehensive because I was born with a deformed hand but the school administration insisted. That’s where trainer John Christopher spotted me and took me under his wing. Back in 2004, he didn’t know how to train a para-swimmer but he persisted. He did a lot of research to understand how I could improve, what workouts I would be comfortable with, and in turn, his dedication inspired me to work harder. The journey since then has been surreal. I started to win international medals and recognition and in turn, expectations rose. My body, however, failed to keep up. In 2009, I started to experience stinging pain in my shoulder. I ignored it for a long time which prolonged the misery to a point when it converted into an injury. That’s when the thought of quitting first crossed my mind. However, my coach was adamant. He didn’t want to give up. He insisted that I go through rehabilitation and I did. The pain receded but never went away. In retrospect—he was right. I pushed myself and won a bronze at the Asian Para games in 2010 which qualified me for the London Paralympics in 2012: my lifelong goal. Reaching the paralympic games was my ultimate goal and accomplishing it fulfilled a dream I had lived with all my life. While I didn’t win a medal, the practise, the stress, the hard-work that went into reaching there was unparalleled. It exhausted me. You could say that I was burnt out. There was, however, a silver lining—my dream was to reach the paralympic games and I did. In a way, I had achieved my goal—there was nothing left for me to do anymore. The shoulder injury, of course, was aggravating and in 2013, the thought of quitting and taking up full-time coaching gripped me again. It was a true low point in my life. I have rarely discussed this but back then, I was suffering from depression. I had a shoulder injury to fight, I had a wavering mind, no focus, my performance was shoddy, and I simply wanted to quit. Once while training in Australia, I was all by myself. I remember that after training for three hours I would lie down and feel as if I were dying. White spots would emerge around my eyes. That’s how tired I would get. I decided that I couldn’t go through the hard-work and pain again. But my coach never gives up and he came up with the solution that I should coach for an hour and swim the rest of the time. The hour got me hooked and changed everything. Spending time with kids made me forget whatever I was going through. Even today, if I am stressed, I spend time with children. I start coaching them and internally, I start healing. Finally in 2015, I called it quits and took coaching full-time. I still swim but I mainly want to have fun as that was lacking for me. Towards the end of my career, I wasn’t enjoying swimming and I didn’t want to get to a point when I avoided getting into the water at all. When I was young, I was a bundle of nerves before every race. But winning at a young age helps you as you’re not aware of a lot of things that happen around you. While I was fortunate to never face discrimination, people still marvel when they see me swim or cycle. I don’t blame them because they’ve never seen a differently-abled person do it. Most people are not even aware that there is something called as para-sports, that those who are differently-abled can do everything a normal person can. What pains me the most is when children who are differently abled are discouraged, when they’re told they can’t do something. People must understand that there is no one way of doing something, there are numerous. It’s all about awareness. If you come across a differently-abled person, perhaps you could tell them that I heard about someone (who is differently-abled) who has won international medals for the country. Enquire if they’ve tried sports. Just pass on the information and help them try to figure out different options in life. The rest is about motivation. It’s the same even when you’re racing. It’s the last 10-15 metres when you have to push yourself, when you have to tell yourself that it’s almost over, just finish it off. That mindset is everything. My personal motto comes from Ian Thorpe, an Australian swimmer. He said, “Losing isn’t coming second but it’s getting out of water knowing you can do better.” I’ve adopted that in my career—swimming and coaching. There have been times when I’ve won a medal but not improved my timing and that has upset me. And much to people’s surprise, there have been times when I have not won the medal but improved my timing, which has made me happy. Today, I am excited to be a coach—but it has come with a price. I am now responsible for various other athletes and the stress is far more. I am not sleeping as much as I used to but the dream is further enhanced: I might have reached the Paralympics, now I want one of my students to win a medal there. Sharath M Gayakwad is an Indian Paralympic swimmer and coach from Bangalore. He was the first Indian to qualify for the paralympic games in London, 2012., and has won 41 international medals with 4 Gold, 15 Silver and 22 bronze for the country. 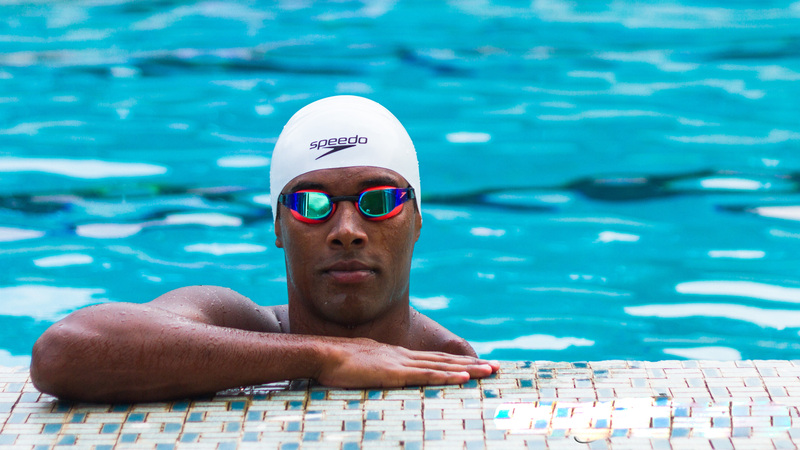 Sharath now trains swimmers to win medals for India at the Olympic and Paralympic Games. He enjoys watching movies in his free time.